Delivering, maintaining, and operating the highest value undersea networks on the planet. Delivering, maintaining, and operating the best value undersea networks on the planet. From the very beginning, SubCom has been a leader in defining the undersea cable industry. We continue that proud tradition today as we drive ever-improving quality and efficiency of undersea data transmission. SubCom designs, manufactures, deploys, maintains, and operates modern networks with an industry-leading track record for delivery and performance, providing the most comprehensive technical and marine expertise, with the highest quality, and most reliable solutions. SubCom combines our research and development, broad product portfolio, manufacturing facilities, fleet of ships, and management team to offer numerous unique capabilities for implementing flexible and scalable repeaterless to ultra-long-haul undersea networks. We engineer custom-tailored systems anywhere on the planet. With a tradition of exceptional reliability, performance and service, and technical expertise, we support our customers’ needs from system design, permitting and marine engineering solutions, manufacturing, installation, to system testing for traditional data transport requirements, as well as scientific and oil and gas applications. Our industry-leading track record allows us to provide robust, highly reliable installed systems on time that deliver the most value to our customers while consistently exceeding expectations for performance and partnership. For more than half a century, SubCom’s fleet has sailed the oceans of the world, maintaining the undersea cables that form the backbone of the international communications network. Maintenance is performed by the industry’s most capable fleet of cable ships from their strategic locations around the globe. SubCom’s Global Technical Support Center (GTSC) provides dedicated support to troubleshoot system issues and SubCom’s Network Operations Center (NOC) services provide support to keep systems operating smoothly and efficiently 24/7/365. "Since the implementation of the Svalbard system in 2004, Space Norway has enjoyed a strong and enduring relationship with SubCom. For over 14 years, SubCom has delivered unprecedented support for this unique cable system, providing uninterrupted service during three capacity upgrades and a CLS equipment consolidation and relocation operation, helping to meet Space Norway's current and future growth requirements. We strongly believe in SubCom's project management and engineering teams to deliver upgrades with professionalism and dedication, and when coupled with the long-term support provided by their Global Technical Support Center (GTSC), we benefit from a level of service and commitment that is second to none in the industry." "Following a very successful transition to SubCom in 2017 as the new supplier for Telstra’s subsea maintenance requirements in the South Pacific Marine Maintenance Zone, the team has continued to provide exceptional levels of service, from the finance team right through to the operational team. It is great to have such a high level of engagement and support." "The collaboration between MainOne and SubCom for the MainOne system was a great success that brought connectivity and economic opportunity along Africa’s west coast. SubCom’s superior technology created a robust and highly-reliable system, and the excellent teamwork and ongoing support we’ve received from everyone at SubCom is again front and center, on our latest MainOne expansion. We couldn’t imagine doing this with any company other than SubCom." "SubCom provided us with an innovative and flexible solution which included a lifecycle partnership through their remote NOC services and commitment to retain a maintenance vessel in our region." "I’m impressed with SubCom’s quick adaptation to mould flexible solutions that meet market demands and customer needs. Tailoring towards the needs of the future…that’s a key thing for me." "The SubCom culture fits perfectly with our developer mindset. SubCom found solutions on terms and design to accommodate our requirements and evolutions, during the system design and then during the implementation." We are very pleased to be working with SubCom to extend our Norwegian sustainable data center and network infrastructure. The quality and experience they have delivered to Norway´s two cables from Andenes to Svalbard above the Arctic Circle makes a very convincing reference to us. SubCom announces agreement to build Diamond Link Global cable system linking Georgia and Romania. Djibouti Telecom, Somtel, and SubCom announce Mogadishu branch of DARE1 cable system. Somtel joins DARE1 submarine cable system, the high-capacity, short-haul cable system that will connect Djibouti, Somalia, and Kenya. SubCom chosen to extend MainOne Cable System to francophone region. New landings designated for 7,000km submarine communications cable stretching from Portugal to West Africa. Google selects SubCom to design and deploy Dunant cable system. Dunant submarine cable system will link the East Coast of the United States to Europe. 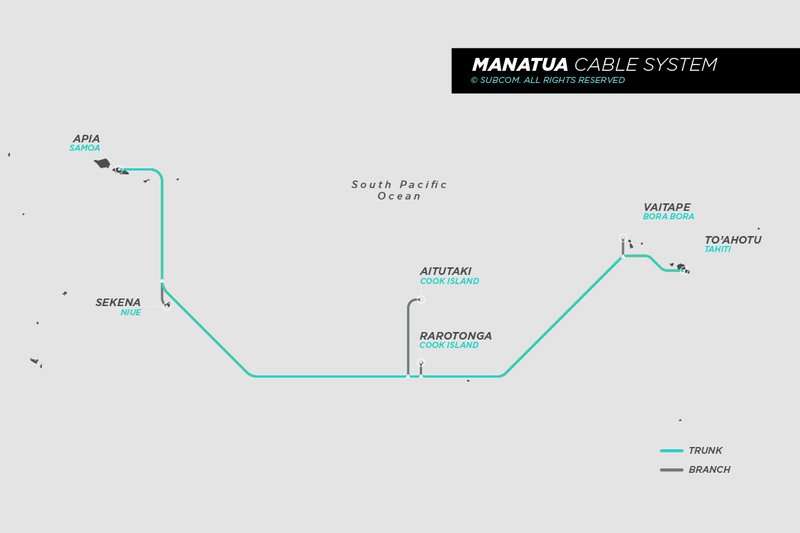 SubCom announces ICN2 cable system linking Vanuatu to Solomon Islands in Force. Eagerly awaited system is the first submarine cable to Solomon Islands. Consortium including Facebook, Google, announces contract in force for SubCom as supplier for HAVFRUE cable system. First new undersea cable to traverse Northern Atlantic, connecting mainland Northern Europe to U.S.A., in nearly twenty years. "How the Internet Travels Across Oceans"
© Copyright SubCom, LLC 2019. All Rights Reserved.